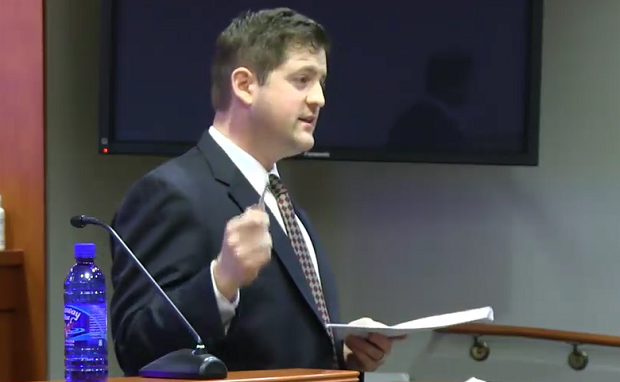 Adam Smith delivers his closing argument on behalf of Keely Youngblood, accused of responsibility for neck and back injuries Michael Blatnik claims he suffered when Youngblood rear-ended him. Jurors cleared Youngblood of responsibility for the injuries. Decatur, GA—Jurors Wednesday rejected a Georgia man’s claim that he suffered long-term neck and back injuries from a rear-end crash with a distracted driver. Blatnik v. Youngblood, 15A56329. The DeKalb County State Court jury needed a little more than an hour to find the injuries claimed by Michael Blatnik were not caused by Keely Youngblood when she hit Blatnik’s car as he sat at a stop sign in July 2013. Blatnik contends the crash left him with herniated and bulging discs in his neck and back. His attorney, the Stone Law Group’s Michael Regas II, requested more than $180,000, including $120,000 for pain and suffering, during Wednesday’s closing arguments. Youngblood admitted fault for the crash, but not for Blatnik’s injuries. She said the accident occurred when she was stopped behind Blatnik’s car but became distracted by a sign that said “TacoCat spelled backwards is TacoCat,” and took her foot off the brake momentarily. “It was just like an ‘Oops,’” Youngblood told jurors Wednesday. The two-day trial turned on the link, if any between the crash and Blatnik’s neck and back problems. "This was a hard fought trial and opposing counsel did an excellent job presenting the plaintiff’s case," Smith told CVN after the verdict. "It was a pleasure to work with lead counsel Mike Regas and his co-counsel Ryan Barnes throughout the trial." Regas could not immediately be reached for comment following the verdict. CVN recorded the trial and will publish gavel-to-gavel video as soon as possible after the verdict. Michael Blatnik is represented by the Stone Law Group’s Michael Regas II. Keely Youngblood is represented by Waldon Adelman Castilla Hiestand & Prout’s Russell Waldon and Adam Smith. Learn how you can watch an unrivaled library of trial footage, from car crash cases to the nation's biggest products liability lawsuits.